This 1940s “live broadcast” of Frank Capra’s beloved film takes us back to the Golden Age of Radio. 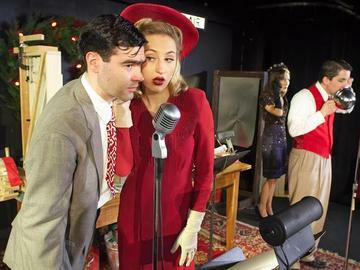 This fresh new adaptation of the film is set in the fictional studio of WVL Radio Theatre on a cold, snowy winter night. Due to the blizzard, the professional voice actors are unable to get through, but the show must go on — so a small but intrepid band of employees manage to create the dozens of movie characters and scenes using just their voices and a sound effects table. With surprisingly simple technical requirements and adaptable staging needs, this exquisitely detailed production fits a variety of venue settings, large and small, and is an uplifting story of struggle and triumph, and of the power of a community to weather financial storms. Presenters can even have their own customized live commercial included in the broadcast — a wonderfully creative opportunity to recognize a local sponsor or patron.